Range: South America, Amazon Basin of Peru and Brazil; not found in Guiana or northeast region. Habitat: Wet forested areas of South America, rainforests, and vegetated swamps. Diet in the wild: Insects especially snails, clams, and crawfish. Diet in the zoo: Insects, snails, canned cat food, smelt, crawfish, fidler crabs. The caiman lizard is large, averaging between 2 and 4 feet in length. Weight is normally between 3 and 6 pounds. 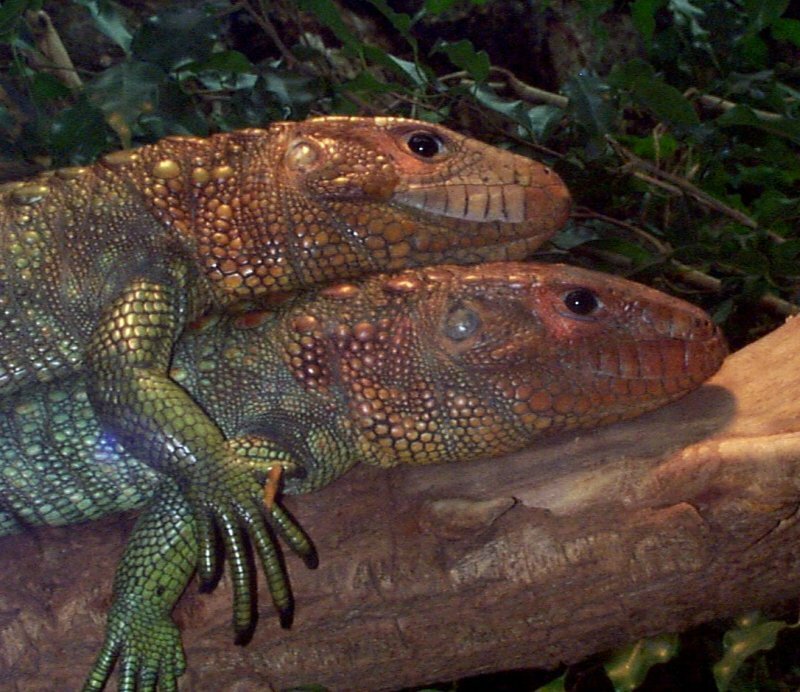 Caiman Lizards have red-orange heads and green bodies. It has a laterally flattened tail. Their heads are very large, and they have movable eyelids. They are covered with scales, many being heavy and large. Caiman Lizards are aquatic and terrestrial. They have powerful jaws, and use them to crush shelled insects, and then extract the soft parts using their flat, rounded teeth. Young caiman lizards may be eaten by birds and larger mammals. The name “caiman” comes from their appearance, which resembles the caiman crocodile of South America. Heavily hunted for the reptile leather trade, hundreds of thousands of these lizards are killed each year for their skin. The Caiman Lizard lives primarily in low swamps and flooded forests, often resting on roots or branches hanging over the water. If disturbed or threatened, the lizard will drop into the water and quickly swim away. The lizard has a laterally flattened tail that helps it to swim through the water. The whiplike tail is also used for defense, it can deliver a powerful blow to any would be predator. The Caiman Lizard's tongue is forked, and is used to enhance its ability to smell and locate prey. They reproduce sexually, laying fertilized eggs. Live specimens were not exported for zoos until 1998 due to international laws designed to protect them. Prior to protection they were once fairly common in the pet trade in the 1960s and 1970s. The caiman lizards are very strong, especially for their size. They are not aggressive lizards by nature; however, you must be careful and respectful when you are around them because they will not hesitate to bite or to defend themselves if they feel threatened. The lizard above has been fitted with a transmitter collar, which is being tested by herpetarium personnel in anticipation of using similar collars to track and study wild populations of these lizards. The Ft. Worth Zoo currently has two caiman lizards on display in the herpetarium. The caiman lizards are quite active and are very fun to watch. It is very fascinating to observe them eat. They will lie around chewing on snails and other mollusks, working on the shell with their powerful jaws, and when they get the meat out they spit out the empty shell.